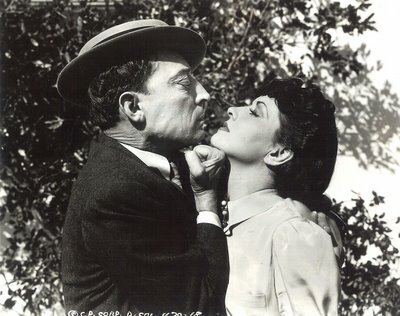 Keaton Columbia Comedies --- We Like 'Em! Buster referred to these as "crummy two-reelers", but I was sure happy to see them coming in the door this week, as this was my first exposure to a Columbia Keaton comedy. How many of you remember seeing these on TV? I never did, and rest assured, my old sixties-era tenna roter took aim at four or five different viewing markets during childhood. None of those stations ever ran Columbia shorts other than The Three Stooges. As mentioned in a previous post, I never went for that team --- but maybe it wasn’t the boys that turned me off --- it was their studio. There’s just something grubby about a Columbia comedy. They always looked cheap to me, and those sound effects they used were so --- icky. All of that weighs heavily upon Buster’s group, but somehow, these ten shorts, representing his entire output for the studio, play a lot better than I ever imagined they would. They were always depicted as the bottom rung on Keaton’s career ladder --- and just how much did he get paid for doing them? The DVD documentary says $1000 (per film? --- per week?). Eleanor said $2500 per subject (he’d gotten $5000 per at Educational). I’m inclined to believe Eleanor. After all, she had to make grocery buys out of those checks, for all of Buster’s family, not to mention alimony and/or child support he must still have been paying Natalie. From what I hear, the two Keaton (now Talmadge) boys were driving over to see their father, now that the older one had his license. I assume that would have been around the time he was at Columbia. 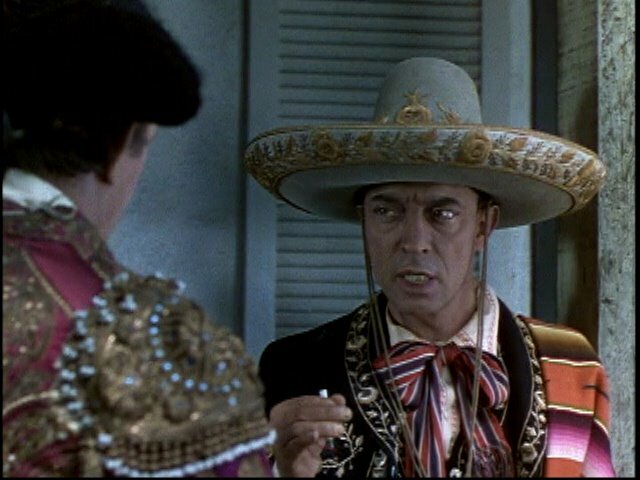 One source says these shorts were distributed "free of charge" to theatres playing Columbia features. Not true, of course. 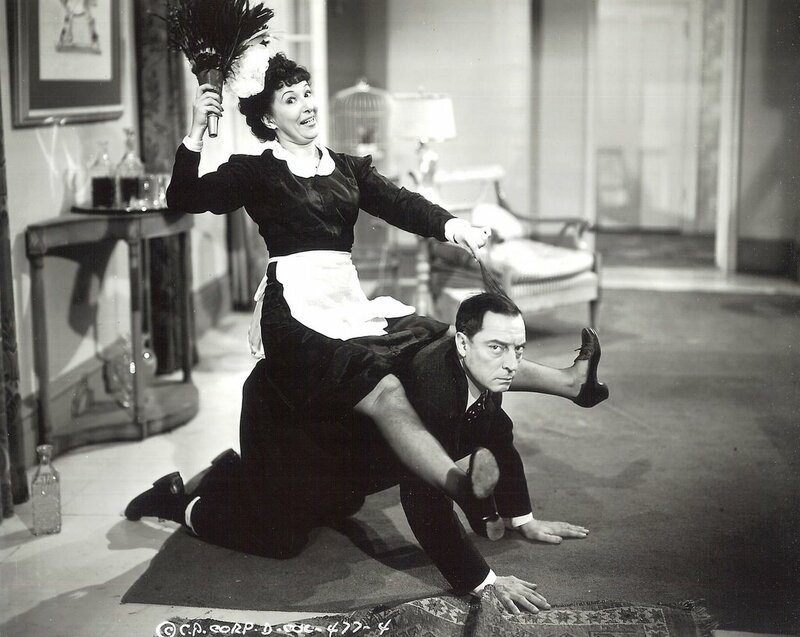 Pest From The West, the first series entry in 1939, brought back domestic rentals of $23,000, and subsequent ones tended to hover around that approximate figure (Nothing But Pleasure did $24,000 --- General Nuisance got $26,000). Columbia also realized profits from re-issues of the Keatons after the war. The Spook Speaks was back for the 1949-50 season, and picked up $24,200, this in addition to the $28,500 it had realized on its initial run. Worth noting here is the fact that every Columbia series ran a distant second to the Stooges, whose comedies averaged rentals of $30,000 plus during the period of Keaton’s employment there. The thing I really admire about Buster is the fact that he ultimately walked out on Columbia, even though they wanted to renew him for another year. Not many comedians would have left money on the table in those days, especially one who needed it as badly as Keaton undoubtedly did. His integrity just wouldn’t allow him to continue doing work he felt was beneath him. Laurel and Hardy would do the same at Fox a few years later. They could have had at least another season there, but pride made them walk. Stan, like Buster, just couldn’t bear cheating the audience any further. Don’t you love it when they refer to Buster as an "old-time dead-pan comedian"? It happened a lot after the career tanked, such as here at an "Old Time Swim Party For Stars," where Buster’s been pressed into service (again) as an over-the-hill pie-thrower. This was May 1941, and the Keaton/pie link had become fairly well established thanks to his extended cameo in Fox’s Hollywood Cavalcade. Of course, Buster Keaton was no more a pie-throwing comedian than Noel Coward, but I guess it made a pretender like Milton Berle feel better about his own from-behind persona when he could use Buster as a glorified comic waiter at one of his parties. And just what was the point of this gathering? Probably none --- other than fact a lot of press would be there, with attendees striking funny poses for fan mags. 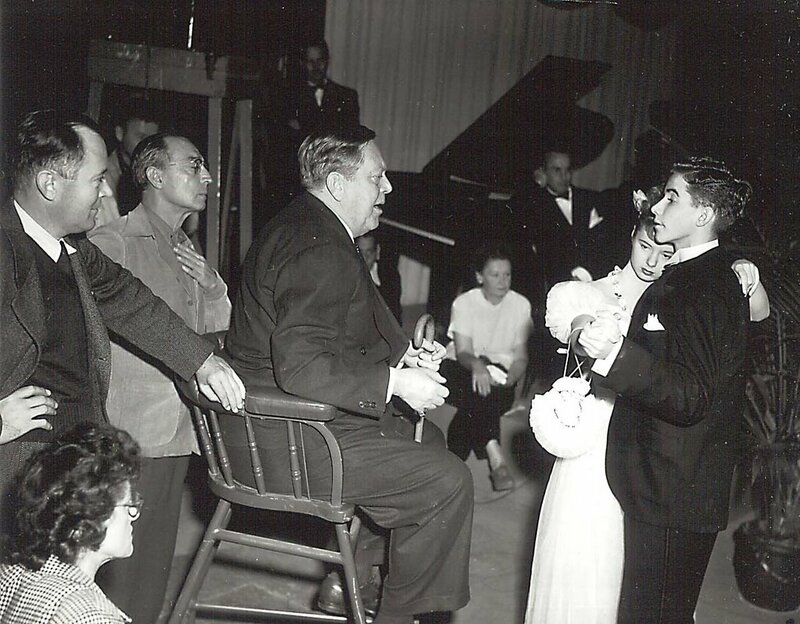 This photo layout captures essential phoniness of the whole "Hollywood Party" racket about as effectively as any. I’d enjoy asking the apparent only survivor, Jackie Cooper, if he remembers having a good time. At Milton Berle’s house. I’ll bet not. Certainly not if what I’ve read about Uncle Miltie is any indication. 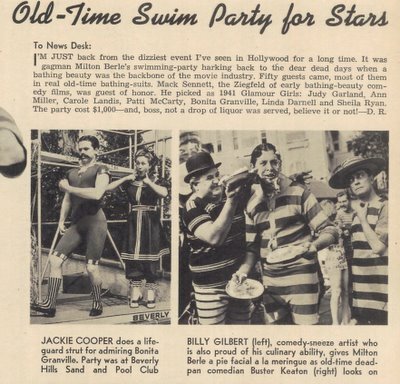 And what’s this about "guest-of-honor" Mack Sennett picking the 1941 Glamour Girls? Imagine how they all treated him. 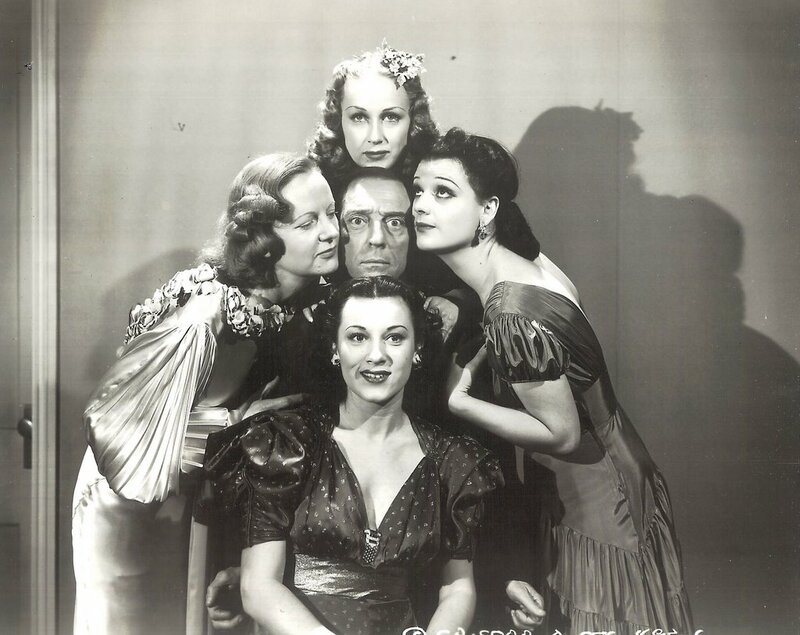 "Dear, dead days," indeed, although we would add a caveat that Mack’s work was nice if you could get it --- what with Carole Landis, Sheila Ryan, and Linda Darnell among contestants. The three tackiest stills are, you guessed it, Columbias. A close shot with Dorothy Appleby is from Nothing But Pleasure, a title which doesn’t altogether describe the short, but there are moments. Harsh direct sunlight doesn’t flatter Keaton, but on a three-day shoot, who’s got time or resource to bring in George Hurrell for stills? This next one shows our man playing horsey for a lesser talent --- the Columbias are chock full of those --- and all of them pretty much rode Keaton’s back. It’s a tribute to Buster's democratic spirit that he never regarded his co-players so indifferently. Bill Fields once regaled a female gathering with priceless greeting --- “Ah, bevy of beauty!” --- but would Buster say the same in the face of such drab coterie of Columbia starlets? They look for having come off location of a Charlie Starrett western. At least Buster had good sense to get out after a few seasons, but what about fates of these poor femmes? 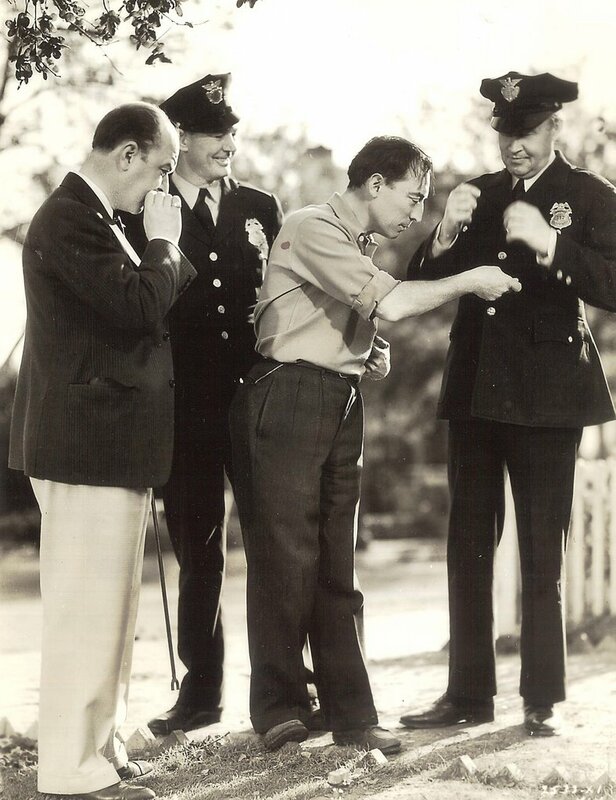 I've never seen those Keaton shorts, but The Three Stooges' early Columbia shorts look nice --almost similar to the Paramount/RKO art deco sets. By the '40s, though, they were definitely acquiring a rather shabby feel. You could say the same thing about the Laurel & Hardy movies at Roach as well. Both studios a lot of location work in the earlier movies, too. I have always been stunned by how shabby the Columbia Charley Chase films are compared to the Roach films, even the last Roach films. The new 2-disc Keaton set from Sony is admirable; I just wish the movies were better! The problem is that Jules White directed these things as if he were making Three Stooges comedies (MOOCHING THROUGH GEORGIA was remade a few years later as the Stooges' UNCIVIL WAR BIRDS, and it's practically the same film, demonstrating how White's films depended on slapstick and physical gags with the stars being interchangeable). I am looking forward to seeing these and although I know that they are not Keaton's material or ideas I do know that Keaton somehow still weaves that magic and I am sure that he rises above the material. I do know that Keaton did try to improve the quality of these shorts and said that if they would just spend a little more money(but remember this is the guy that filmed the most expensive scene in Silent Film History, so you can understand their hesitancy) and let him develop his own ideas and storyline he could almost guarantee better $ returns. Perhaps because they kept saying no that Keaton just decided to leave, he didn't like confrontation and Eleanor was at this period I believe still working as a dancer with MGM. The actual Columbia contracts reveal that Buster was paid only $1,000 per picture, which gradually increased to $1,250 for the final entries. I have received the DVD set mentioned, and do remember these comedies run along side 3 Stooges shorts in the late 1950s in the Detroit market. "So You Won't Squawk" and "Pardon My Berth Marks". They make buying the entire set worthwhile! The 8 others range from amusing to irritating!